I couldn't help but notice the weird shape of my Shubunkin goldfish's backside and tail. I told my mother about this and it's been there for quite some time but I had not noticed it before. I'm afraid it might be getting bigger. 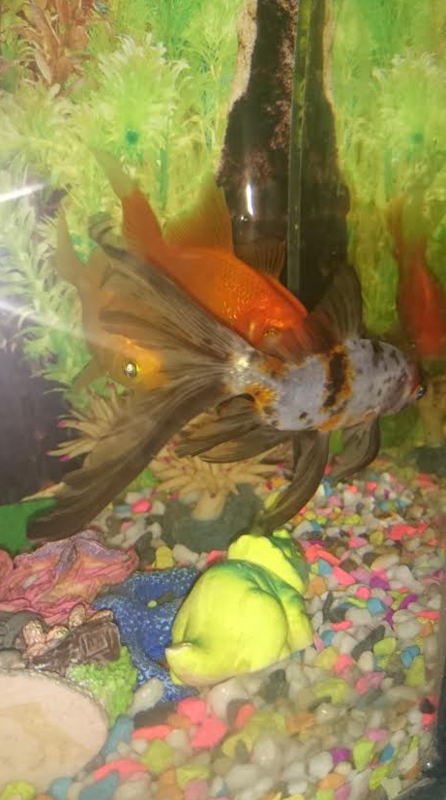 Below is the best image I got of the fish as it likes to move around a lot. Anyone know what might it might be? Does it look swollen or is the fish just deformed? If it is deformed, the fish should be able to cope. Is it behaving normally, eating well etc? If it is swollen, there could be an underlying disease, though if your mother is correct and it's been like that some time, disease sounds unlikely. To me, it looks swollen but of course it could be just a deformity I've not noticed before. It makes me wonder that if I've only noticed it recently, could it be getting bigger? It's something I need to keep an eye on but I feel really bad for the poor fellow. The fish is swimming, and eating well. I'm not sure if he's pooping though. Another one of our goldfish (I don't know if it can be related) is doing long stringy light brown poop. If I recall correctly, the colour of the poop used to be a darker brown and I'm highly certain it's only been stringy recently (past couple of weeks, maybe?). Stringy poo, though usually white or clear, can be a sign of an internal infection, though as this can be bacterial, protozoan or parasitic it is hard to know what to treat for. The first thing to try is to make sure it is not constipated. Cook some peas (or save some from your meal), squeeze the insides out of the skin and chop them up a bit. I had fairground goldfish many years ago and they ate them with relish. Then don't feed anything for a couple of days. This should clear out any constipation and could clear the symptoms completely. I'll do some peas later. Can it be any peas or a specific type? Just the kind of peas you eat, fresh or frozen. Even frozen peas from a bag of mixed veg. They can be microwaved in a bit of water for around a minute if you don't want any yourself. The other possibility is that the fish has eaten some of the gravel. I had a veiltail once, very similar to your fish, who had a habit of eating the gravel - sometimes she eventually managed to choke it up, but, for a while, I was convinced that it had gone further down and she had trouble swaying her tail when swimming and everything seemed to be drooping. I also had a single-tailed common/comet goldfish who had a habit of investing the substrate too. I gather it's quite rare - but it does happen. Peas are worth trying, but, if that still doesn't work, then live or frozen bloodworm can sometimes rectify the problem and cause a "clearout" of any blockage if there is one. If you happen to eat papaya fruit, then a tiny morsel of that can also work wonders - but it has quite a violent, laxative effect, so I'd only try that as a last resort and be prepared to do a thorough tank clean soon afterwards! Okay, I've put two peas in the tank. There is 4 fish in total and I haven't seen any of them poop properly yet. I wasn't sure how many peas I should do so I kept it to a small amount. I'm nervous about the results, I don't want to harm them! No need to be nervous about the results - peas are a well-established form of food for goldfish, particularly in this sort of situation, and there won't be a sudden result but hopefully within 24hrs of them eating it. All peas did was create extra poop floating around. Not sure which fish as whenever I checked, they had already pooped. I'll keep an eye none the less. That's good. If the fish you were hoping would eat it has done so, and therefore any blockage cleared, then it's altogether possible that that's just the shape that the particular goldfish is. Topics that relate to "Shubunkin goldfish has an enlarged backside"
HELP Goldfish in a tropical tank?